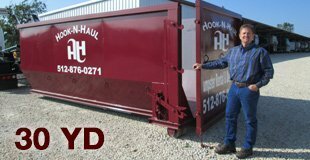 The 30 yard dumpster rental is our big daddy dumpster, with a swing open door to help you load the heaver items without throwing out your back to get it over the higher walls. 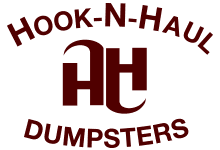 This dumpster rental is ideal when you have a complete home renovation of a larger house, a larger commercial clean out or project, or a small home demolition, or new home construction job. This dumpster can handle just about anything and can hold up to 14 to 15 truck loads of material. We understand that when a customer is in need of a larger roll off dumpster like our 30 yard dumpster that they have a large job, which is why we offer a longer rental time for up to 14 days. This will be an ideal dumpster rental when you have larger or bulky items such as furniture that you need to get rid of. The swing open door allows easy access to dispose of it with little hassle. When you are debating on renting a 30 yard dumpster then just give us a call at (512) 876-0271or you can just email us.